The New England North West has great potential for mineral, petroleum and renewable energy generation. The Gunnedah coal basin contains the State’s third largest coal reserves (12 per cent of NSW’s resources) and has significant potential for coal seam gas, with deposits covering over 3.4 million hectares.16 Not all the coal and coal seam gas reserves are at depths that make it feasible to consider extraction under current market and technology conditions. The value of the region’s mining production grew by 24 per cent each year between 2006 and 2014, contributing approximately $1 billion in gross domestic product in 2014-15.17 The region will continue to benefit from the economic diversity and employment flow-on effects of the mining industry. The largest mineral resource development is in the North West. This area contains the region’s coal and coal seam gas reserves, with existing open cut and underground mining concentrated either side of the Kamilaroi Highway between Narrabri and Werris Creek. The New England contains important deposits of other minerals, including gemstones, industrial minerals and extractive materials, with many small-scale mines in operation. The current planning framework around mining and petroleum (including coal seam gas) proposals will continue. This will allow balance between the mining and agricultural industries, providing a range of economic opportunities for the region. Parts of the North West’s most productive agricultural land are located in areas with economically viable mineral and energy resources. In August 2016, the Government secured the cancellation of the Caroona mineral exploration licence, covering approximately 344 square kilometres of the Liverpool Plains. The Liverpool Plains provide some of the most productive and valuable farming land in Australia. The NSW Government has committed to increasing its efforts to reduce the area of encroachment of coal exploration licences into the strategic agricultural land of the Liverpool Plains. Negotiations have commenced with Shenhua to relinquish parts of its mining title that encroach onto such land. The Government’s recently developed Strategic Release Framework for Coal and Petroleum includes a preliminary regional issues assessment process and community engagement to ensure that, in future, the potential impacts on a region are considered in advance of the release of exploration licences. The NSW Government has controls in place to prevent impacts on agriculture and water resources throughout the region through various strategic tools to effectively manage the industry, including the Aquifer Interference Policy. The Hunter Valley rail network is a key rail infrastructure asset as it enables the mining sector to transport coal from the Gunnedah Basin and produce from agricultural industries in the North West to the export Port of Newcastle. The movement of coal dominates the rail freight network and the coal industry is funding improved track and network capacity. The region has potential to be a leader in the development of renewable energy generation by harnessing solar in the North West and wind energy in the New England. The region receives 19 to 20 megajoules daily of solar exposure, making it the second highest solar penetration region in NSW. Wind speeds can also reach up to 10 metres per second in some parts of the New England North West. There are proposals for large wind and solar farms that will generate job opportunities and investment in the economy from construction, operations and connection to the State’s electricity grid. These proposals have potential to provide electricity to around 285,000 homes each year, nearly four times the number of homes in the region. The renewable energy sector is also injecting infrastructure worth over $700 million into the region. recognises renewable energy generation opportunities by promoting the potential for renewable energy projects that can readily access the electricity grid. The region has a rich and diverse geology creating future potential for mineral and energy resource exploration and production. It is recognised that there are competing uses for land in this region and that there is a need to balance these interests in order to deliver the vision for this region. That is, to deliver a region with a sustainable future that maximises the advantages of its diverse climates, landscapes and resources. As part of the process to achieve balanced outcomes, the NSW Government has introduced a Strategic Release Framework for Coal and Petroleum (including coal seam gas). This is a mechanism to review and define which lands may constitute new exploration release areas. New exploration licences will only be issued in areas released by the Minister for Resources and Energy after an assessment of resource potential and economic, environmental, social factors and community issues. Community engagement and an upfront assessment of social, environmental and economic issues will occur through a preliminary regional issues assessment. Overall, the new Framework resets the NSW Government’s approach to issuing coal and petroleum exploration titles to ensure that it is transparent, informed and consistent with the NSW Government’s broader land use resource strategies. The New England North West region has rich and varied mineral and energy resources that have the potential to add value and diversity to the regional economy and that of the State. These resources also contribute to local and regional development through infrastructure construction and maintenance. Industrial minerals are important inputs to manufacturing and agricultural businesses. Construction materials support new housing developments and the development of infrastructure assets. Energy resources including renewable energy sources are of value not only to the region but also the State. The NSW Government has several policy and legislative tools to support the sustainable development of the mineral and energy sector, while protecting the environment, agricultural lands and the health of regional communities. This includes the recent improvements to the regulatory environment for coal and petroleum (including coal seam gas) development. COAL SEAM GAS – natural gas from coal seams (a form of petroleum). EXTRACTIVE MATERIAL – sand, gravel, clay, soil, rock, stone or similar substances, but does not include turf. GAS – natural gas found in several different rock types including sandstone, limestone, shale and coal. MINERAL – a solid naturally occurring substance including, but not limited to, coal, oil shale, agate, bauxite, copper, diamond, emerald, fluorite, gold, graphite, iron, lead, opal, potassium, rutile, ruby, selenium, silver, topaz, vermiculite, zinc and zirconia, but not including petroleum. A full list of minerals can be found in Schedule 1 of the NSW Mining Regulation 2016. MINERAL AND ENERGY RESOURCES – minerals, petroleum, gemstones, extractive materials and renewable energy. MINING INDUSTRIES – industries that mine mineral and petroleum resources. PETROLEUM (INCLUDING OIL & GAS) – any naturally occurring hydrocarbon, whether in a gaseous, liquid or solid state, or a mixture thereof. Australian and State Government policies relating to the mining and energy industries are continually evolving in response to governments’ improved understanding of national issues and opportunities. Enhancing our collective understanding of the location, value and attributes of mineral and energy resources throughout the region is an important step towards the sustainable management of this sector. Over the coming decades, the region will continue benefiting from the economic and employment flow-on effects of the development of the mineral and energy industries. The NSW Government will continue to work with the Australian Government to identify lands capable of accommodating large-scale renewable energy projects to support the development of these industries. construction industries, which use fine aggregates to make concrete and asphalt and coarse aggregates as road and rail ballast. Information regarding potential and/or identified mineral and energy resources is available from the Division of Resources and Energy. The data will be updated as geological knowledge is acquired. Current resource titles and title applications are available on the Common Ground Website and geoscientific data is housed in the Department of Industry’s Geoscientific Data Warehouse. the Preliminary Regional Issues Assessment for Potential Coal and Petroleum Exploration Release Areas Guidelines. The following will support the sustainable development of the mining industry within the New England North West. Provide geoscience information related to the mineral and energy resources of NSW, and transparently monitor development activity. Current resource titles and title applications are available on the Common Ground website and geoscientific data is housed in the Department of Industry’s Geoscientific Data Warehouse. Use this information to work with councils, industries and other stakeholders to plan for the future of mining industries and identify the short, medium and long term development priorities to guide investment decisions for these industries. Ongoing investment to develop mineral and resource industries will help underpin the economic prosperity and ongoing productivity of the New England North West. 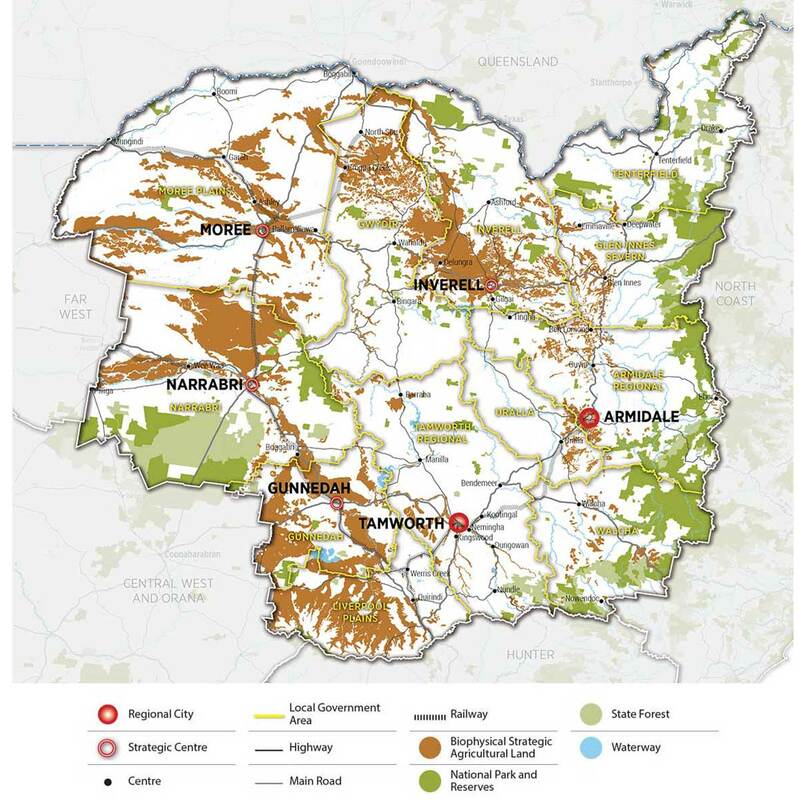 This draft Plan identifies priorities for managing mineral and energy resources, Biophysical Strategic Agricultural Land (also referred to in Goal 1) and the anticipated regional growth demands driving urban expansion within the regional cities and strategic centres around the New England North West. As the New England North West continues to grow, and new economic development opportunities emerge for mineral and energy resources industries, there is potential for conflict to continue, and for competition over water resources and the infrastructure necessary to support other uses. Land use conflicts require a whole-of- government response. The NSW Government is already responding to community concerns about the long term future of coal and petroleum (including coal seam gas) mining around the State by developing a policy framework for the strategic release of areas for coal and petroleum exploration licences and assessment leases. Most urban areas are not close to current production activities; however, land use conflicts can arise if urban uses are expanded close to mining activities or infrastructure (such as rail corridors and electricity easements). It is important that the potential impacts of mining proposals, for example, noise, vibration, dust and traffic, are rigorously assessed and mitigated. Land use planning can also assist by maintaining the availability and quality of terrestrial and aquatic resources that have the potential to sustain industries within the region. Mining activities have specific operational needs that can compete with other sensitive uses; however, they are also temporary, dependent on the productive life of the facility or resource. As mineral and energy resources have been identified (see Action 2.1.1), there may be opportunities to identify interim activities that can occur on the land, without sterilising its future resource potential. However, any land use changes contemplated in advance of the extraction of resources must be carefully considered. The Council of Australian Governments Standing Council on Energy and Resources prepared a Multiple Land Use Framework to assist in planning and managing multiple land uses.18 The framework includes a series of principles that can assist in planning around mineral and energy resources, where other high value land uses also exist. Developing land use plans that respond to the lifecycle of mineral and energy resources will enable all stakeholders to better understand the long term productive value of the land and provide greater certainty for investments. These land use plans may consider how identified mineral and energy resources can accommodate a range of uses, either sequentially or simultaneously, with extraction‑related activities. transitional stage – consideration needs to be given to transitioning to other land uses, once the underlying resources have been extracted. infrastructure that responds to the staging of developments and likely future land uses. Work with relevant councils, communities and industry to deliver staged land use plans that respond to the lifecycle of resource activity for active and emerging mining areas in the Liverpool Plains, Gunnedah and Narrabri. Urban and rural residential encroachment into identified mineral and energy resource areas impacts on the viability and future growth potential of rural and resource businesses and can result in land use conflict. effective and efficient provision and management of infrastructure and services associated with mining activities. Work with councils to avoid potential land use conflict between urban and rural housing and identified mineral and energy resources when preparing local strategies. Work with councils and industry to identify where demands for additional urban lands coincide with identified mineral and energy resources, and develop strategies to sequence the release of these in line with mining activities. The assessment process provides the opportunity to assess mining applications, specifically, to identify and manage potential land use conflicts that may arise during the life of a project. The mineral and energy resource industries are also assessed annually to enforce compliance with their conditions of title. A robust and transparent assessment of mining applications is required to balance social, economic and environmental implications. improving mechanisms to protect biodiversity and manage offsets in mining areas. The NSW Government is currently responding to community concerns about mining by clarifying the requirements for assessing and determining mining applications through the implementation of the Integrated Mining Policy. The policy will improve transparency, consistency and accountability of assessment decisions. Providing consent authorities with a more comprehensive understanding of the environmental impacts and proposed mitigation measures will improve decision-making. The policy does not lower environmental standards or community consultation requirements. Existing processes to manage and mitigate the environmental impacts of a mining development will be further supported by improving methods to assess the cumulative impact of all relevant activities (including mining) on air, water and soil quality around settlements and strategic agricultural lands. Implement the Integrated Mining Policy, including finalising economic assessment guidelines. Develop a cumulative impact assessment methodology for mining proposals. Investigate appropriate methods for encouraging best practice rehabilitation and visual impact management for mines. Prepare a development assessment guideline for impacts on human health from dust generated by mining and other activities. A strategic and integrated approach to renewable energy projects is needed to leverage the high wind and solar exposure in the region and contribute to the diversification of NSW energy supplies. The Department of Industry’s Renewable Energy Action Plan (2013) guides renewable energy development in the State to support the national renewable energy target.19 As part of the plan, the NSW Government will help to streamline negotiations between network service providers and investors so that timeframes for grid connections in NSW are competitive. TransGrid is seeking to build a renewable energy hub in the New England that will connect the region’s wind farms to the NSW electricity grid.20 The hub will more than double the capacity of renewable energy that can be connected to the electricity grid. Councils can support the growth of the renewable energy sector by incorporating environmentally sustainable measures into the design of developments and subdivisions (for example, stormwater re-use and cogeneration) and providing employment lands for possible research and development opportunities in the sector. Uralla has been identified, along with several other NSW communities to be part of the Zero Net Energy Towns (ZNET) initiative. This project, which is funded by the Office of Environment and Heritage helps towns to generate and source their own energy from renewable sources. Identifying locations that have the necessary infrastructure and corridors to allow renewable energy projects to access the electricity transmission network is a priority. Councils will identify these locations in planning strategies and apply appropriate zonings in local environmental plans. Work with councils and infrastructure providers to identify potential renewable energy projects by mapping renewable energy resource precincts and infrastructure corridors with access to the electricity network. Develop analytical tools to identify and map large-scale renewable energy potential, including wind, large-scale solar, bioenergy and geothermal by building on existing information such as the NSW Renewable Energy Resources Map and the Australian Government’s Renewable Energy Mapping Infrastructure. Support the development of renewable energy projects in line with the NSW Renewable Energy Action Plan. Share knowledge of potential renewable energy projects, renewable energy resource precincts, hubs and infrastructure corridors with access to the electricity network and the like. Work with councils and industry to identify and support smaller-scale renewable energy projects such as those using bioenergy or waste coalmine methane.